Not every character in the Avengers movies have their own movie franchise, but Thor has managed to maintain his own part of the MCU. But he's not quite a tier 1 Avenger in a manner of speaking but he does have a decent enough following. The first two movies in the franchise have been fairly serious and perhaps crafted in a manner to make them seem more regal or Shakespearean. Thor: Ragnarok took a very different track and crafted a movie that may be funnier than the Guardians of the Galaxy sequel. They capitalized on the few good one-liners that Thor had been given in prior movies to build a story that was a lot lighter but certainly still tied to the roots of the character's comic book history in different ways. As always the MCU movies aren't about a need to be accurate with respect to the comic book source material or even the Norse myths that inspired the comics. They're their own creative enterprise and this may be the new direction that the franchise needed. 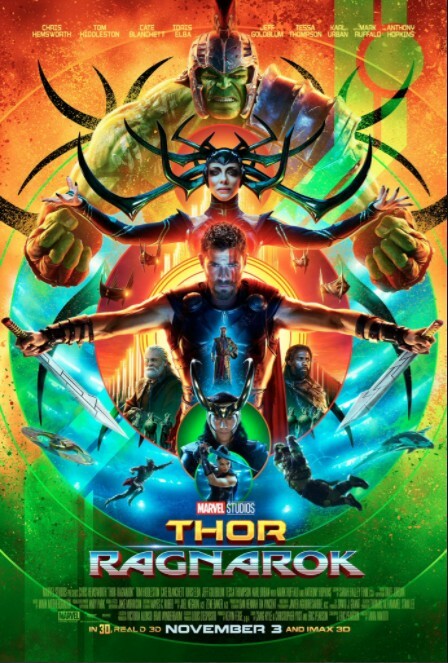 Synopsis: Thor: Ragnarok is the third movie in this franchise and was directed by Taika Waititi. The screenplay was written by Eric Pearson. At the end of Avengers: Age of Ultron, Thor (Chris Hemsworth) took off to search the nine realms for signs of the Infinity Stones given a vision he had. But more specifically, the movie begins with Thor bound in a cage in the realm of Surtur (Clancy Brown). His mission to safeguard Asgard from the dangers of the Infinity Stones has expanded to also trying to stop Ragnarok, the mythic prophecy that foretells the destruction of Asgard at the hands of Surtur. On Asgard, Loki (Tom Hiddleston) has been secretly ruling while disguised as Odin (Anthony Hopkins). The real Odin has been left on Earth without his powers and apparently this risks the prison he had crafted to contain Hela (Cate Blanchett), who turns out to be he first child of Odin and one with a particular penchant for power and destruction in her role as the Goddess of Death. With Odin's time in existence coming to an end indirectly because of Loki's meddling, Hela is on the brink of returning to the Nine Realms and taking control. 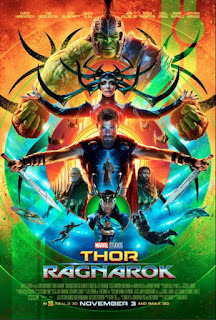 What I Liked: The writing behind this movie was brilliantly witty and once you get past the initial monologue / narration by Thor regarding his predicament, the movie really takes off. They juggled a lot of characters from across the MCU and found a way share a narrative in a manner that resulted in a very fun story. And there were so many great characters in this movie from end to end. Valkyrie (Tessa Thompson) was a fun addition to Thor's world and I'm glad she wasn't quite an immediate love interest. And we need to take time to celebrate the styling for this movie. The earlier Thor movies were somewhat darker but tried to incorporate the original Kirby art style. But this movie turned it up to eleven and really gave us the full Kirby experience that the Thor franchise deserved. Hela's headgear has always been part of her iconic look from the comics and the trailers showcased that pretty well. But man, Sakaar really got the Kirby treatment with guards that seemed to be armored in the same style as the Celestials and ships that are both blocky but also chaotically organic. And I loved every moment of it. What Could Have Been Better: To nitpick, I'm not too clear on what Hela's power set is. Thor is the God of Thunder so he can wield lightning bolts as needed. Hela is the Goddess of Death and she can...summon infinite blades of varying sizes? She raises a particular subset of dead warriors with a distinct armor but not anyone else she defeats in battle? It gets a little weird at times. Karl Urban as Skurge didn't make that much sense either in terms of a character arc. He was presented to be super selfish and keen on collecting various weapons and other small treasures. But then rest of the movie doesn't clearly present him as being all that greedy or violent. Heimdall (Idris Elba is super badass although his ability of being able to see far off into all of reality seemed rather inconsistent. And Anthony Hopkins really didn't want to wear the full Odin armor again I guess. You'll see what I mean. And the two post credit sequences for this movie was super underwhelming. They didn't feel like they were worth waiting for, but I guess that's also because most of the comedy was in the main movie and the was no need to balance things off with post credits stuff maybe? TL;DR: Thor: Ragnarok is a super fun sequel and a great addition to the overall MCU. It may not have as many serious implications for the larger plot but that may depend on how the next Avengers movie turns out. Thus the movie gets a well-deserved 5 hammy speeches by Thor out of a possible 5.